It’s no fun being broke. While Everton’s extraordinary early form has yet to generate any interest in our players, you do worry. We literally cannot say no to any offers, even when we know that the cash recouped will just drop into a black hole of debt. 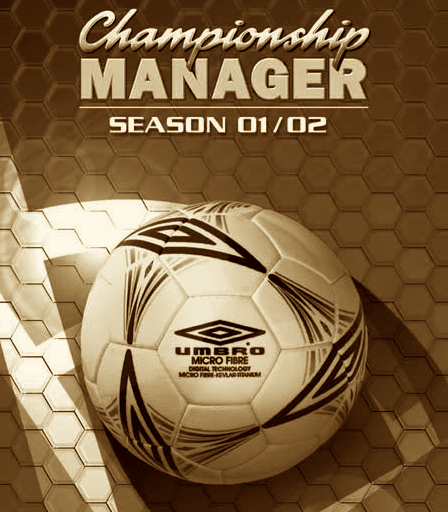 If this was a link-up game, there would be broken friendships and tears before bedtime. 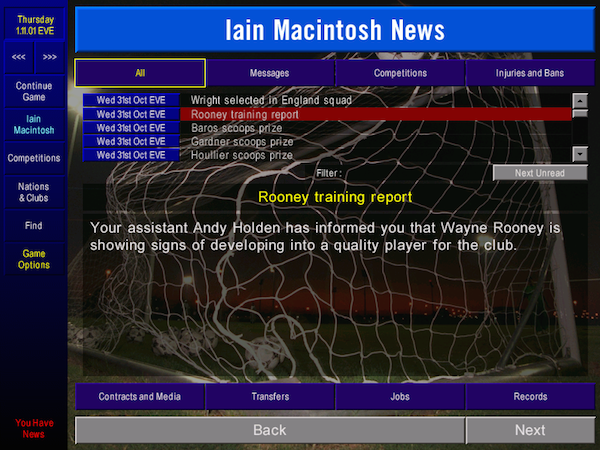 Fortunately, the AI managers seem entirely unaware that they could snaffle Wayne Rooney for just under £3m. While that’s certainly helpful, it still leaves us unable to strengthen. And some of our players are really, really bad. Still, onwards and upwards. 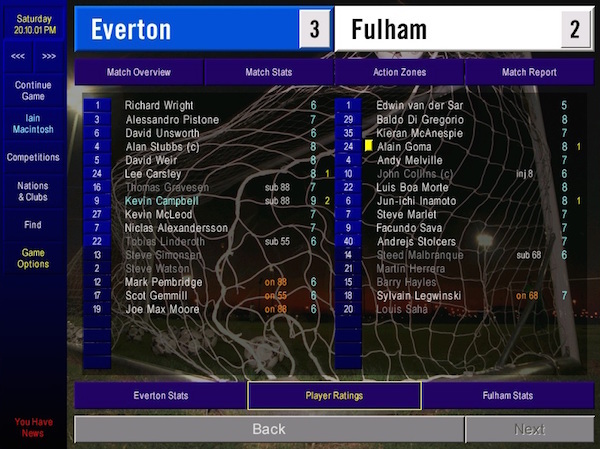 Jean Tigana’s Fulham are happily bobbing about in the top half and with Edwin van der Sar in goal, they’re hard to beat. This is not a good time to lose top scorer Tomas Radzinski to injury. But there’s nothing we can do about that. We just have to play Kevin Campbell and get on with it. 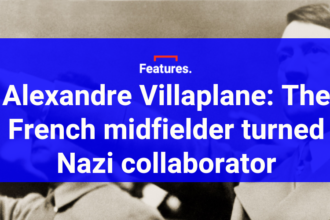 He’ll be flanked by mediocre wide boys Kevin McLeod and Niclas Alexandersson, while the triangle of Tobias Linderoth, Thomas Gravesen and Lee Carsley holds it all together in the middle. We tackle hard, we press hard, we play short passes and we close our eyes and pray that the results keep coming in. And somehow it works. Taking advantage of a rare poor performance from Van der Sar, we take a swift 2-0 lead through the remarkable Campbell, who bounds around winning headers all over the place. Alain Goma grabs one back in the second half, but Carsley responds almost immediately with a spectacular solo effort. It’s a little irritating to concede on the full time whistle, especially as we pride ourselves in shutting games down, but let’s not be picky. It’s another win. That’s four on the bounce. Elsewhere in the world, it looks like Rangers have picked up something of a bargain. If they’d shopped like this for the last fifteen years, the Scottish coefficient might be a bit more perky. We’re finally starting to see the return of injured players, which might actually provide some options. Options are nice. Big Duncan Ferguson is back in full training, but he looks very poor for the reserve team, so he’ll stay on the bench for now. 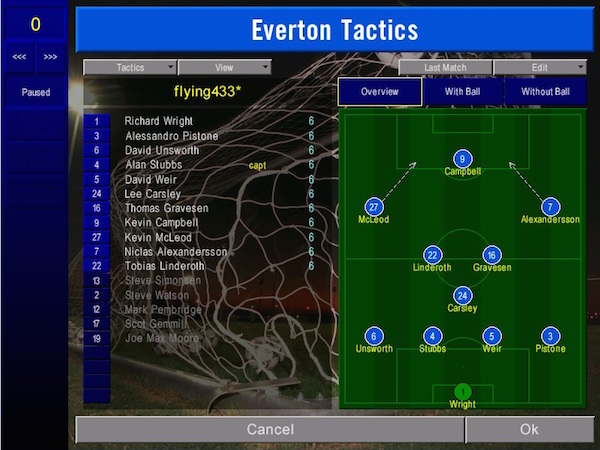 Scot Gemmill is back too and with Linderoth continuing to underwhelm, I move him into the first team. He’s not very good, per se, but he’s got some work rate and we like a trier round here. Besides, it’s West Ham next and they are in appalling form. 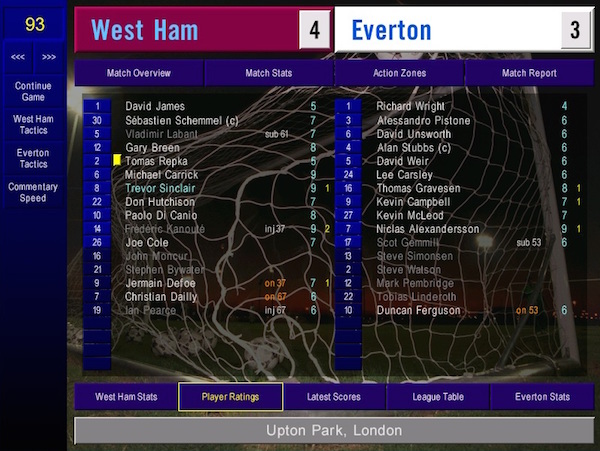 They play with Joe Cole as a left winger who cuts in and so I dispatch Carsley as a brutal man-marker and tell Alessandro Pistone to get up and exploit the space that Cole leaves behind. It’s a masterplan. But it all goes horribly wrong. 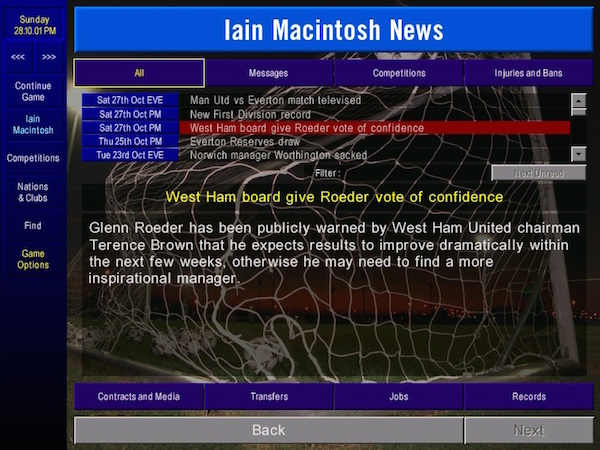 We take another quick 2-0 lead through Campbell and Alexandersson, but Glenn Roeder changes West Ham’s tactics and before we can respond, they’re back in the game. Two goals in three minutes from Freddy Kanoute level the score while we’re still frantically tapping the tactical changes button. In these days, of course, you have to wait for a break in play. Not that the changes help. Shortly after half-time, Jermain Defoe puts the Hammers ahead. Everything they hit is going past Richard Wright. On comes Big Dunc for the miserable Gemmill and we go to 4-4-2. 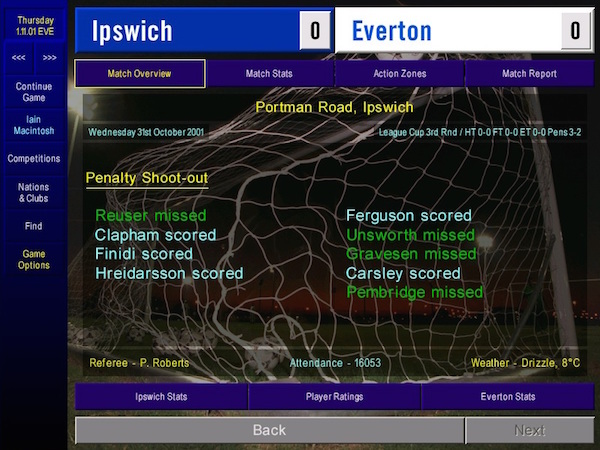 Gravesen gets us back in the game with a free-kick, but within minutes Trevor Sinclair crashes home the winner. This is a deplorable result. I’d make wholesale changes if I actually had any players. The last thing I need is Bolton Wanderers away. 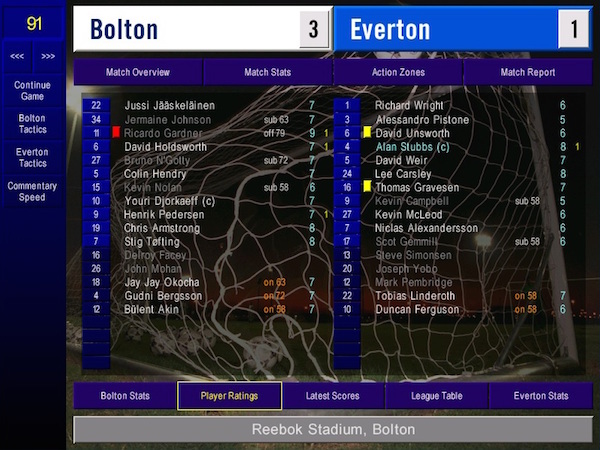 Bolton are a nightmare in this game. 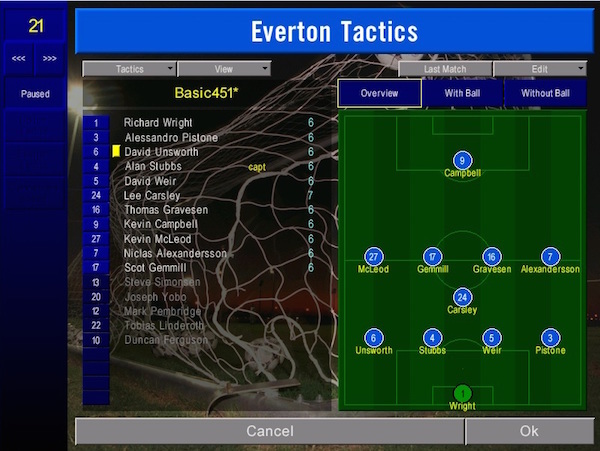 Sam Allardyce plays a 5-3-2 with creative players, rampaging full-backs, big strikers, midfielders who like long shots. They’re a nightmare, especially away from home. With morale on the floor after that beating at Upton Park, I play it safe. Every Bolton player is man-marked and we go deep, so deep we put the crowd to sleep. And here is where I make the biggest mistake of the season so far, one that I can’t blame on finances or ill fortune or Kevin McLeod. Because the plan works. We don’t give Bolton an inch and they can barely get a shot off. The only drawback is that I can’t get a shot off either. And at half-time, I blink and return to the 4-3-3 that’s served me so well. Allardyce must have laughed his great big head off. In a gruesome nine minute spell, they take a three goal lead through David Holdsworth, Henrik Pedersen and Ricardo Gardner. I throw Big Dunc and Crap Tobias into the fray, but it makes no difference. We scrape a last minute consolation goal when Gardner is sent off, but we lose again. And we deserve it. I deserve it. 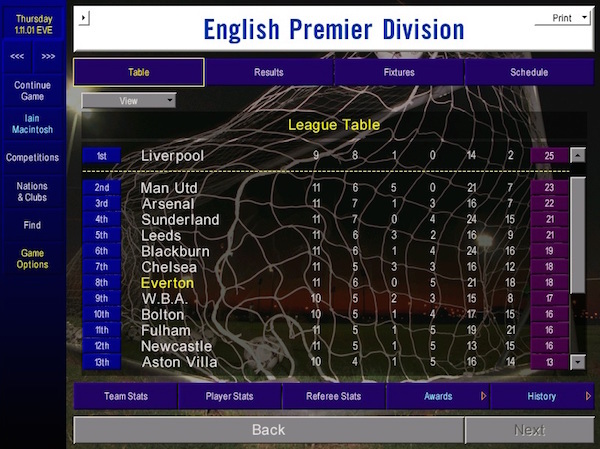 The League Cup has always been high on my list of priorities. 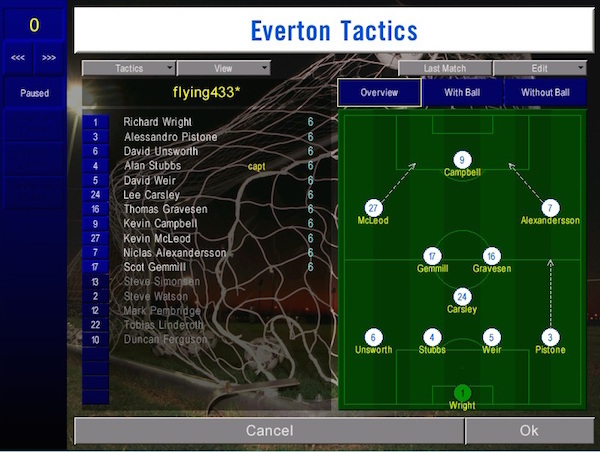 The aim of the challenge is, after all, to win silverware with Everton. But now it’s even more important. If we lose away at Ipswich, we’ll have lost three games on the spin and it’s very, very hard to pull out of a nose dive like that, especially when you can’t buy players. And Ipswich are weird. They play a flat back five, two wingers, just the one central midfielder and two false nines. It’s time for another change. Joseph Yobo, far and away the fastest defender we have at our disposal, is back in full training. It hurts me deeply to take David Weir out of the team, but Alan Stubbs is the captain and so the decision has to be made. Heart-breaking. We play well. Having conceded nine goals in three games, we finally remember how to defend well. And technically we keep a clean sheet. But we can’t break them down. They take us all the way to a penalty shoot-out and we manage to miss three spot-kicks. Big Dunc and Carsley come through for us, but Gravesen, David Unsworth and Mark Pembridge fall short. We’re out of the League Cup to lower league opposition. I am SO Everton. Of course, no matter how bad you’re feeling, there’s always someone worse off than yourself. In this case, it’s Roeder. Despite his victory over me earlier in the month, he’s deep in the brown stuff and may well be the first Premier League managerial casualty of the year. And there a few encouraging signs, if you know where to look. He hasn’t been performing especially well for the reserves, but the coaching staff seem quite confident about the prospects of one our young strikers. And, finally, we’re still in the top half of the table. The aim of the season was to survive and we’re surviving. If we only win one game a month until the end of the season, we’ll be just fine. But when you look at this table and you know that you lost to West Ham and Bolton, you can’t help thinking what might have been. For the next episode, click here.